I've always loved Pizza Hut's creative stuffed crusts, so whenever there's a new variant available, I make sure to try it out. And because of my adventurous nature when it comes to stuffed crusts, we dared order the newest Cheese Burger crusted pizza when the friendly phone operator offered it. However, it wasn't exactly what we thought it would be. We got the family size Super Supreme Cheese Burger (P649) and was shocked when we opened the box. Forgive me if I'm an un-updated soul living under a rock, but I thought the cheese burger crust would look something like their sausage stuffed crust, but just using ground beef. However, it looked nothing like that. Instead, it was this oddly-shaped UFO-looking pizza with a crown crust, topped with mini-burger patties and melted cheese. We can't help but just stare at how weird our pizza order looked like. Sorry Cheese Burger Pizza, but I think we'll just stick to our favorite Parmesan Cheese Crust. After some searching, I found out that this "crown-crust" pizza was already selling in the Middle East since last year. And apparently, it has now made its way to the Philippine market. While my whole family doesn't dig this bizarre combo of pizza and cheeseburger by Pizza Hut for aesthetics and technical (problems with properly holding a slice) reasons, I have to give it to them that a slice indeed tastes like legit cheeseburgers, especially with the big tomato slices, lettuce leaves and ketchup thrown in. However, we probably wouldn't be ordering another Cheese Burger Pizza any time soon. 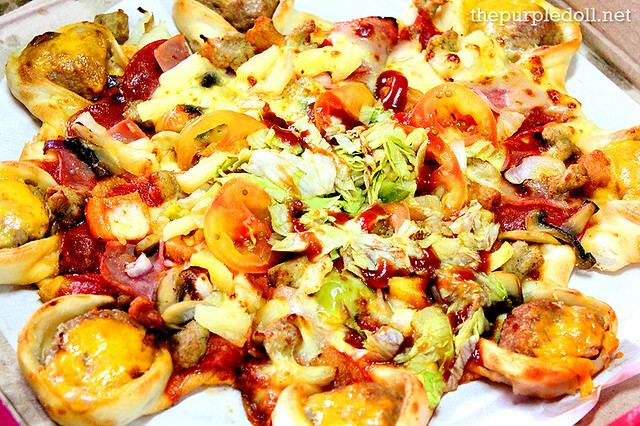 How about you, have you tried Pizza Hut's crown-crust Cheese Burger Pizza? If not, would you be interested to try it? Anyway, have a safe and happy weekend, friends. That can resolve my dilemma if whether I want a pizza or a cheeseburger. It looks weird but it's worth a try. Cheese Burger Pizza? Wow, need to eat this now..hahahaha..salivating again. I am hungry. Wow I cannot say no to that yummy crusted pizza. It's a must-try for sure from my favorite pizza restaurant. :) On the other hand, I can already imagine the loads of calories it contains. My type of pizza, cheese-topped one. Never mind the crust, yummy na yan for me. @. @ pizzzzaaaaaaa. That pizza looks delicious. Holding that pizza does look like it poses problems but nonetheless it is still pizza and burgers!!!!!!! As usual the foods looks oh so yummy- my mouth- waters! I haven't tried this yet but I agree with you that the pizza is quite uncomfortable to hold, it looks delicious though. I would eat that even if its uncomfortable to hold! Looks delicious and I am now craving for pizza because of your post. Cheese burger pizza? Mmmmm... that looks like it's worth a try. Who could resist that? it looks so delicious. It's definitely weird looking but looks delicious too. Can't wait to try it. That looks like one big mess. The crust is a bit odd to look at though. I'd stick with my all time fave hawaiian pan pizza from pizza hut. Yum! I think this would be best with BEER!!! ...Just got hungry..
Haven't got the chance to taste this one, yet. But it looks so yummy! wow,it makes me so hungry,yummy! itsura pa lang nakakagutom na,. ipapasalubong ko yan sa mga anak ko,. mukhang masarap,. This is also what we usually order for takeout or delivery! Yuum!